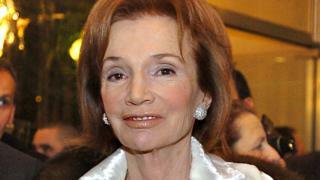 Lee Radziwill, the socialite and younger sister of former US first lady Jacqueline Kennedy Onassis, has died at the age of 85, US media report. Radziwill, who became a fashion icon and counted Andy Warhol and Truman Capote among her friends, died at her home in New York on Friday. She had careers in acting, writing, and interior design, and was married three times - including to a Polish prince. Her daughter told the New York Times she had died of natural causes. Born Caroline Lee Bouvier in 1933, Radziwill later became a friend to numerous artistic celebrities and fashion moguls and was frequently included on international best-dressed lists. Radziwill's first husband was Michael Canfield, son of the president of the Harper & Brothers publishing house. She later took the last name of her second husband, Polish Prince Stanislas Radziwill. The couple had two children. Her third marriage was to Herbert Ross, director of the iconic films Footloose and Steel Magnolias. Radziwill was said to be close to her sister Jacqueline, who died in 1994, although there were also US media reports of sibling rivalry. In an interview with the New York Times in 2013, Radziwill said she felt "lucky that there was so much more interest in my sister", but that "at times it was annoying, at times funny". "Perhaps the most depressing part was that whatever I did, or tried to do, got disproportionate coverage purely because of Jackie being my sister". In 2016, she told Vanity Fair that the years in which she had a US president as a brother-in-law were restrictive. "There were so many things I couldn't do," she said, adding that the tragic death of President John F Kennedy made her feel "free". Following the news of Radziwill's death on Friday, Mathilde Favier, who works at fashion designer Christian Dior, described her in a tribute posted on Instagram as "the most elegant and tasteful lady on Earth". Another fashion designer, Michael Kors, tweeted a photograph from the company's official Twitter account showing himself and Radziwill at his label's 30th anniversary in Paris in 2011.